Windshields are designed to protect passengers and the interior of your car from outside elements as well as provide clear vision for driving. They’re sturdy and meant to withstand a decent amount of weathering before they actually show any signs of deterioration or damage. But sometimes, no matter how careful we are with our driving or car maintenance, accidents can still happen, and damages can still occur. 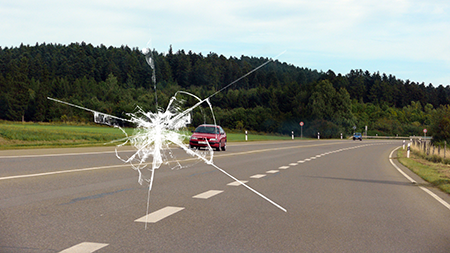 A windshield can get chipped by rocks and debris, or be cracked by a vehicular collision. It’s tempting to brush off small damages, so long as the car is functioning and vision isn’t severely impaired. Unfortunately, that is the wrong mindset to have and we’re here to tell you why. We list down the major reasons why driving around with a chipped windshield is a bad idea and why you should have it repaired immediately. A cracked windshield is like having a chink in your armor – no matter how protected you may feel, there’s still a weakness that can be exploited, which can eventually lead to your demise. Once the structural integrity of your vehicle has been compromised, even minor ones, that’s a good time to think of the possible repercussions having a damaged windshield can have for you and your passengers’ safety. Types of chips and cracks vary, and most are fairly easy to repair, especially for experienced auto technicians such as ours at King Brothers Collision. Call us and have your windshield assessed today. If your driving vision is impaired, you are a safety risk. Major frontal collisions almost always require having the whole windshield replaced, especially intense web-cracking that make the windshield unrepairable. Smaller chips and cracks, on the other hand, are easier to ignore but will get annoying after a while. Dust, dirt, water, and other objects could accumulate in the cracks, possibly staining and further impairing your vision. Prolonging the repair of your damaged windshield increases the chances of it getting worse. Strain from repeated use of your car could make cracks spread, making them harder to repair. Cracks 12 inches or less are easily repairable, and should be taken to a repair shop as soon as possible. Best to nip it in the bud early rather than shelling out more cash to have the whole damn thing replaced. Not only will it be cheaper, it’s less work too. Have one of King Brothers Collisions auto technicians assist you on your decision to either repair or replace your broken windshield. The legalities of driving with a damaged windshield can vary across states and depend on the severity of the damage itself. Some states may require an immediate replacement or repair following a road accident, while some may offer a little more leeway. Always remember that you and your passengers’ safety should always come first. There should be no compromises. Consult your local ordinance on how best to go about your windshield problems. Sometimes the best solution is the simplest one. A car’s windshield serves as protection from outside elements such as rain, snow, insects, debris, and your occasional angry mob. Think of it as cool shades for your car. Rolling around with a chip or cracked windshield will not only further worsen the current damage, it will compromise the safety of your vehicle, additionally prompting you to spend more on repairs or replacements. We, at King Brothers Collisions, take pride in being able to find whatever vehicular problems you may encounter from cracked windshields, oil changes, or exterior paint detailing. Whatever that may be, give us a call at 13-534-8090 (Redford) or 734-744-8557 (Livonia). You can also fill out our online contact form and we’ll get back to you at a more convenient time.